Hey guys this is DizzyPW here with an interview on yet another promising upcoming Kickstarter campaign. Gloria Victis brings back the classic setting of medieval Europe with the notion that magic is just a myth whispered in legends and glowing armor is a silly notion you would read about in children’s books. But there is plenty of mystery to this game still with only limited alpha footage on the market so we got a chance to speak to Liting Zhu of Black Eye Games to learn more. OnRPG: Hello! Can you introduce yourself and tell us about your position at Black Eye Games? Hello OnRPG it is a pleasure to be here, my official titles are Public Relations Manager and Marketing Director, but my roles are quite diverse and also branch into lore, game mechanics, and concept design as well as community management involving maintaining strong communications with our fans and taking in propositions and opinions on the development of the game. Firstly I would like to apologize in advance to the readers for the long answers but they are a necessity as everything required explanation as we are breaking new earth with Gloria Victis. OnRPG: With most of the industry leaning towards Korean developers and flashy armor, what inspired you to turn the tides with Gloria Victis’ more basic realistic art style? Gloria Victis was developed in the spirit of realism and passion. We ourselves are gamers and I think we can speak for all gamers when we say that we are fed up with the current flood of low-quality games with recycled textures, storylines and generic quests. 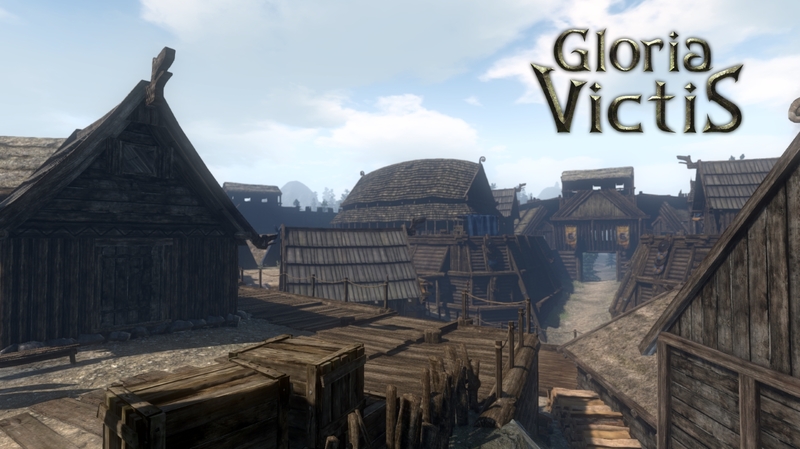 Gloria Victis seeks to break the paradigm and develop a game with realistic graphics and more realistic gameplay. The textures and artwork are labours of love, mostly done by hand with no corners cut, which is also true for the rest of the game as we are true aficionados of the medieval period and are truly passionate in the development of our project. So, if we were to follow the industry direction of using Korean styled graphics it truly would be selling a part of our souls, something we would rather not do. OnRPG: On that note I’ve read you plan to create a rather open world for creativity, customization, and roleplaying. How do you intend to balance the classless system and what are some of the options you plan to offer players that might impact and differentiate their characters? Yes it is true that we intend on creating quite an open world with open character development and we have addressed the need for differentiation between players in such an environment. Firstly it’s the most obvious feature of customization of physical appearances; the player is able to customize in great depth how their characters will look when the game is at the final stage of development on top of the base racial features and options pertaining to a specific race in the game. Players from different races would look distinctly different from each other. Furthermore, different forms of armour are actually all viable options. There is no specific piece of armour that is “the best.” Players would have different choices in armours they wish to wear depending on their playing style; for example players who are confident of their abilities in combat would opt for lighter or even leather armour to give them extra mobility and stamina over their foes. Shields and Surcoats will also be emblazoned with the player’s coat of arms to further diversify player appearance. 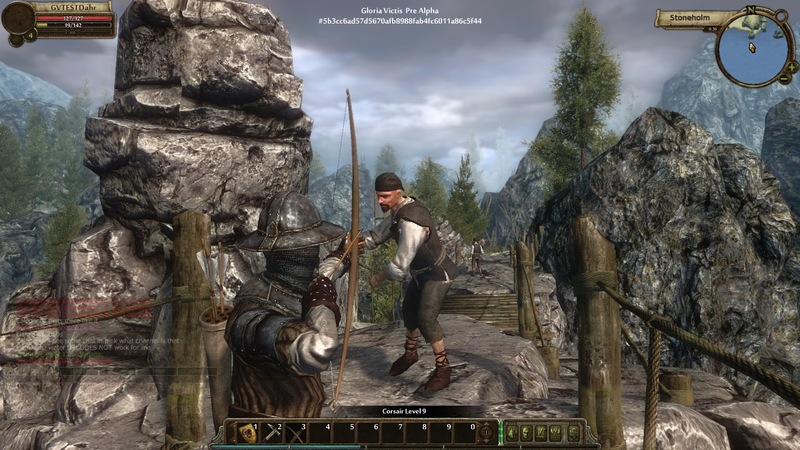 In terms of playing style, Gloria Victis also offers a complex NPC reputation system to offer players an option on how they wish to play the game, whether it be from the angle of a scoundrel or an honourable knight. OnRPG: What effects will nation choice have on your character customization? Do you choose your nation before or after character creation? Players would choose their faction during playing creation but defections in game could be a possible option we can implement. Factions have a huge impact and influence on player gameplay. Firstly the heavy non-linear content would vary greatly depending on faction. Playing styles due to the weather associated with the region in which the faction is located would also play a part in equipment choice. Each faction will have specific spectrums of physical appearance that the player can customize so players from one faction would look physically different from one from another whilst still maintaining enough freedom to give themselves a unique look. Factions also have race specific equipment sometimes but mostly this is just focused on the aesthetics of the equipment such as the Northern Tribes’ fur trim armor. OnRPG: And in terms of crafting, if the armor doesn’t shine how do you intend to visually differentiate well refined armor from the standard? In Gloria Victis, it isn’t really differentiating good armour from the standard, but differentiating bad armour from the standard. Graphically speaking for example armours that are not of the best standard would have perhaps cracks, dents or rust in certain places. Weapons could be slightly warped, have chips or rust whereas a sword of masterwork standard would have a perfectly straight blade. It’s not really a matter of how to show an armour is better in terms of sparkles and shine like in current MMORPGs but to show a piece of equipment’s quality by the lack of defects which we feel to be a more realistic portrayal of equipment. OnRPG: Wow not at all the answer I was expecting. Good stuff! But moving on I’m a sucker for non-target based action combat. And better yet I rarely see two MMORPGs with this system in a way that it just feels like a copy of another. How does your combat system play out? In combat, players will be able to control every aspect of their attack. Players will be able to choose how they are to attack whether it be a slash, stab or smash. They are able to choose which direction to attack and when to attack. They can hold their sword in the air preparing for the blow and strike their opponent when their guard is down. The same mechanics also apply to parrying, blocking and dodging so a player’s skill plays a crucial part in determining the outcome of a fight. Furthermore, there is a stamina counter in fights as swinging a 5 pound sword around is quite a tiring affair and it is unrealistic that the player should be able to be constantly slashing and stabbing away at their enemies. Different equipment also affects how battles play out. In Gloria Victis as mentioned earlier there is no specific piece of equipment that trumps all other forms of equipment. Heavy Plate Armour for instance would offer the player more protection but the player would experience greater stamina drain and slower reaction speeds, so it is quite a viable tactic for a lightly armoured opponent to outwit the one wearing heavier equips, but of course it offers very different play styles which would depend on the player. For both mounted and unmounted combat, speed would be a calculator in damage so when two shield walls clash at full speed there certainly will be a deafening crunch. On horse the bonuses of speed would be far more obvious as momentum and speed would play a far larger part in calculations. There are several other factors such as terrain and weather that would affect how combat plays out but to explain them one by one would take too long. Gloria Victis aims to create a combat system as diverse and dynamic as possible. OnRPG: Sounds like you guys have a pretty unique physics engine powering Gloria Victis. On that note I noticed a rather random video of the Black Eye Games team going out and bashing each other with swords and hammering steel on an anvil. Is the game utilizing any type of motion capture techniques for the animation or was that just to give the animators a guide? Sadly we are true indie developers with no funding at all we do not have motion capture technology. That video was more to do with a little bit of stress relief and fun for our team but with also the intention of experiencing the truer elements of combat, coders experiencing in person just how consuming fighting in full plate armour was in order to code a realistic stamina system. We also received an unexpected easter egg in this exercise which was the knowledge of how unreliable medieval weapons can be (Having a sword shatter in behind the scenes video) and therefore equipment being damaged beyond use (but not beyond repair) is not an impossibility. OnRPG: To say magic is non-existent in Gloria Victis wouldn’t be quite right. What kind of powers do you intend to allow and how do you intend to keep this magic so exclusive to a select few? Magic will exist in Gloria Victis, but in a very low quantity and is more of an elite art than common knowledge. The wealthy in medieval times would often foray into the field of Alchemy and as a result accidently discovered Chemistry. In Gloria Victis one form of magic that would be available would be something similar to alchemy. Another aspect of magic would be in the form of the spiritual beliefs during Medieval Europe in the form of auras. For example medieval people often believed that doing a particular rite or practicing a particular custom would offer benefits such as longevity, health or luck. These “beliefs” would take the form of cult beliefs, and to be able to be initiated into the mysteries of a particular cult, the player must have built over a period of time good relations with them for them to willingly divulge their secrets. The benefits would be “auras” that reflect the benefits believed to be associated with performing those particular rites, in this sense there are also negative auras in the form of curses. So in a nutshell, magic is not non-existent but more of an elite privilege based on belief and pseudo-scientific discoveries. OnRPG: So how does the game play out? Do you collect quests in the hubtown and go? Do you just run around fighting people? Lay out some of the gameplay options for us. The player has a great choice in deciding what they wish to be. For instance they can purely choose to be a craftsman whilst still receiving experience points. They could choose to be a hunter, only killing animals and making a living off the bounties of the forest. Questing at the start would be advised but they will not be generic quests but role-playing and will allow the player to start their integration into the NPC community which is heavily important for the non-linear content available. Deciding who to fight is also part of the gameplay choices. Do you wish to be a scourge to a kingdom by plundering their caravans or earn the respect of the merchants by hunting brigands? Who you can become is very diverse in Gloria Victis and each decision you make affects the complex reputation calculator, providing corresponding variations in quest options. OnRPG: What elements of local customs and lore in Poland can the dev team draw upon to differentiate its tale from other games? As we have stated, Gloria Victis is a low fantasy game where most mobs will be either animals or humanoid, however like magic, fantasy also exists in low amounts in the game. Instead of putting features such as tentacles, lion’s head, oxen body into a hat and drawing out features until an abomination that can be made typical of how bestiary in current MMORPGs are designed, the fantasy based mobs in Gloria Victis will all have a story behind them, a slavic folk tale or slavic myth and their behaviour in game will reflect the details in these folk tales. For example certain folklore based mobs will only come out during night-time. You will not see silly jumping mushrooms or a half lion half fish mob in Gloria Victis. Things that exist in Slavic Folktales such as Giants and Daemons (A small goblin like creature known for stealing children) are examples of the low fantasy content based on Slavic Folklore that will be in the game. OnRPG: Well I can certainly rest easier not having to worry about wild fish lions on the loose. While we’re talking bestiary let me ask about your interesting pet system. Will it be in the benefit of most players to train a pet or is it more of a time intensive system that requires more advanced skill acquisition to benefit only those who really delve into it? 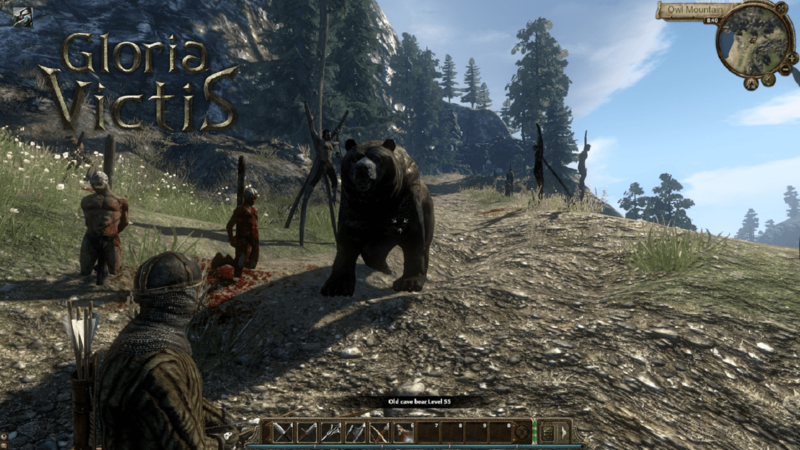 The pet system in Gloria Victis also differs from current MMORPGs. Players need not delve too heavily into it to reap the rewards but the player would be expected to expend a fair bit of effort in the basic training of their pets (as with pets in real life). Examples of pets would be dogs that could help you track and hunt, falcons that can help you hunt bird game, hawks that can help you scout and wolves that would fight alongside you. Pets are mainly hobby based as they are in real life, but they also offer the player conveniences and more options if they do choose to invest in one. OnRPG: I hear your Kickstarter campaign and another alpha test are coming up soon. Have anything you want to say to our viewers about the campaign? Gloria Victis is a truly awesome game, built on passion and realism and is a true indie project unlike most game that are currently on Kickstarter that are basically big game studios pre-selling their game. We promise to launch a much more streamlined, coherent and concise Kickstarter this time and we really need funding to continue due to software costs and the need to turn our coders full-time. The Kickstarter will likely be in Early April which will be after our pre-alpha launch as our Kickstarter video will not be a game trailer that shows footage that will never be in game or just be distracting CGI, but instead be true in game footage and gameplay. As we have no marketing funding we rely on the patronage of game portals generous enough such as OnRPG to spread the word. So it would be a great help if you could support us in the next Kickstarter either by donating, spreading the word or supporting our Kickstarter reddit post. OnRPG: What plans do you have for Gloria Victis if the funding goes well? I heard voice acting was a possibility. Any other major features? As you already know, each faction has a different copper currency but the world shares common currencies in the form of precious metals such as silver and gold. Therefore, we could add an exchange rate in game which is calculated automatically based on caravans raided, the season and random factors that can affect trade and harvests of the kingdom. Guilds that control a region will receive their respective income in the respective copper currency of that region, so it is in their best interest to care about their nation’s economy by protecting caravans etc. Players will be able to take part in the politics of their kingdoms taking ministerial posts and likely implementing policies that can affect the faction (Will provide details in the Kickstarter). The example I will give will be an assassination instance. Players can get together and attempt to sneak into an enemy castle or for the truly daring a capital city. Players can attempt to sneak in either separately (Spawn in different places of the city / castle) or bribe a merchant to hide them in his merchandise (Spawn together in a warehouse but higher chance of detection). Once inside, the player’s goal is to assassinate someone of importance whether it be a NPC or player holding a ministerial position and escaping safely. Players in this case could use the dynamic weather system to their advantage, seizing their chance perhaps in a dark and stormy night. OnRPG: Thanks for your time. This interview was a breath of fresh air and I’m glad to see a few rising star titles with unique features actually having a chance to see the light of day thanks to Kickstarter. I wish you the best of luck and hope to share news in the future of a successful Kickstarter campaign!